Machine Gun Preacher (2011) – Winning. Words. ‘Won’t somebody think of the children?’ isn’t Machine Gun Preacher’s tagline, but considering the film’s crippling lack of nuance or restraint, something that melodramatic would be entirely fitting. Not that its depiction of a war-torn East Africa, where children are the ones who bear the bloody brunt of warlord Joseph Kony’s sadistic political campaign, is something to be ridiculed. The war in northern Uganda is a worthy topic deserving of in-depth scrutiny, and Preacher intelligently finds it way in via the true story of Sam Childers. 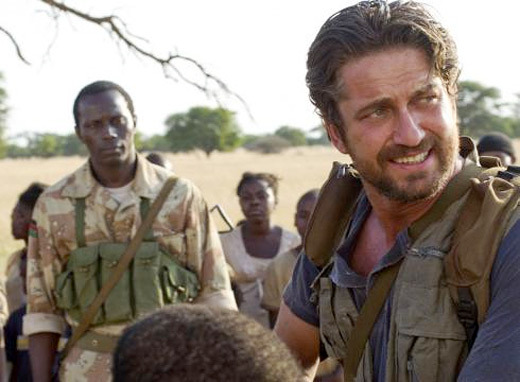 Here played by Gerard Butler, Childers goes from leather-vest-wearing druggie to born again Christian, embracing his faith and answering a call for help from Uganda, where he gets caught up in the troubles. Portraying Childers with livewire emotion, Butler is fantastic. His unlikely hero is a man whose addictive personality has him do-gooding with the same frenzied energy that he boozed benders. But by focussing so intently on Childers, director Marc Forster does his film a disservice. That’s especially apparent in the casting of Michelle Monaghan and Michael Shannon (as Childers’ wife and buddy respectively), who are given seeds of intriguing subplots that are never given a chance to germinate. Meanwhile, less involving characters get more screen time – including a wise little boy who’s pure cliché. All that could have been forgiven had Preacher’s Uganda segments packed enough wallop. True, Forster doesn’t blanch at the ghastly reality of the war – bursts of graphic violence offer insight into the truly horrific happenings. But as the real victims of this conflict emerge in their bloody masses – those defenceless children – Forster all but hammers his message home with a sledgehammer. Repeatedly. As the little bodies begin to pile up, Preacher tumbles into unforgivably preachy territory – replete with scenes of Butler screaming at his church congregation – and the film’s final act suffers under the considerable weight of those hard-bitten images.